MARTIN WONG (American, 1946-1999) painted the world in bricks, sweat, and sign language. He moved to New York City in 1978 and his work often depicted the urban blight of that time while being singularly saturated with deeply humanist joy. Wong was an “outsider among outsiders”: as a gay Chino-Latino painter, he sidestepped the detached conceptualism of many of his contemporaries in favor of social realist tributes to the gritty ecstasy of city life, homoerotics of prison and firemen, the voyeuristic nature of language, and queer black and brown love. Wong died from AIDS-related causes while in the care of his parents in San Francisco in 1999. 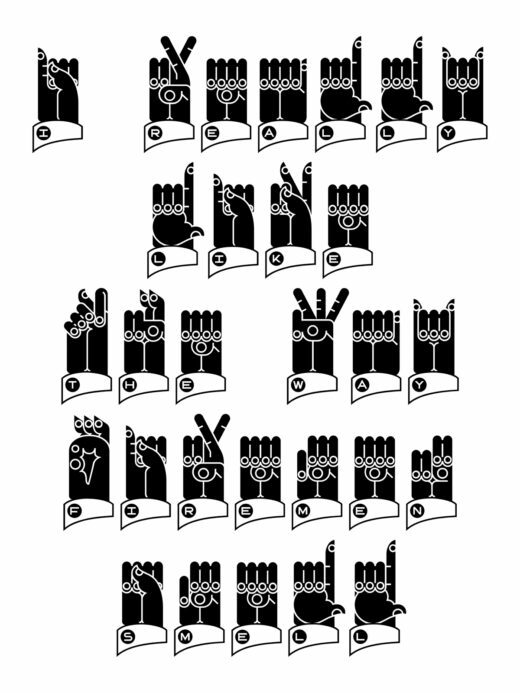 This font is based on the sign language system that Wong stylized and incorporated in his myriad paintings and artworks. Gaps in the alphabet were filled by emulating existing forms as needed. It is the second font in a Queer Year of Love Letters.